Crescent City Swoon is a New Orleans based bath and body company that also offers a monthly subscription box! All of the products are cruelty-free, phthalate-free, paraben-free, and handmade. Ships to: the US. Shipping to my address in Baton Rouge, Louisiana is $7.98. Here is the business card for the creator of Crescent City Swoon! The party bombs from Crescent City Swoon are less frilly, more nourishing experiences that always leaves my skin soft when I finally step out of the tub. This has a scent blend of pink carnations, ylang-ylang blossom, and cedarwood- it was earthy with a touch of sweetness. This has the same great nourishing ingredients, only with a floral scent bouquet of rose blossoms, violet, and gardenia. This is exactly the scent I want to reach for when I am embracing my femininity! This little bomb of joy is a blend of grape, peach, plum, sparkling citrus, rose, and musk. Honestly, I want to take these notes and pour it into a glass with champagne, because it is tasty! This cute little heart is dipped in cocoa butter for extra moisture and smells like a wedding cake! I really enjoy wedding cake, so this is a nice substitute until people start inviting me to their weddings that I’ll go to specifically for the dessert. I actually used this with the cupid party bomb and it was an epic bath cocktail that nourished and soothed my tired muscles and mind. This has the same scent as the Carnival Queen party bomb, only it has the added benefit of looking fabulous and foaming up like a true Queen. This fancier bath bomb seriously is a bath bomb and bubble bath in one, and I love it. 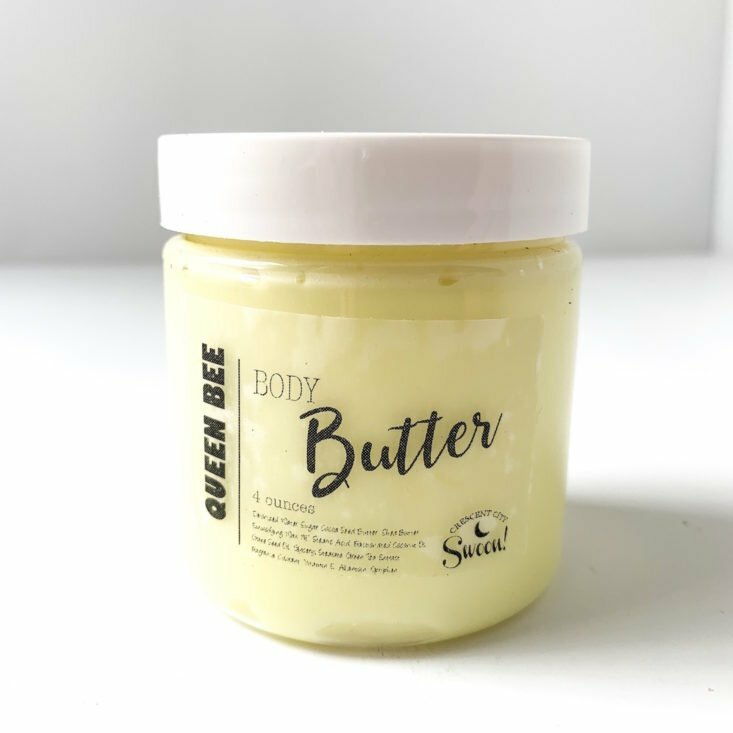 This body butter has a light scent blend of honeysuckle, honey, and crisp Spring air that is perfect for layering under stronger perfumes. This absorbed into my skin quickly and left my legs feeling smooth and not weighed down. I loved the nods to Mardi Gras found throughout this box too. Laissez Les Bon temps rouler! The Verdict: I thought the Mardi Gras/ Valentine’s Day combination theme for this months box was absolutely fabulous! I also love that I got FIVE different bath bombs- opening up this box and seeing them truly felt like a treat. This month’s box has a total estimated value of $45.90, which is above the cost of the box plus shipping. If you appreciate supporting small brands that send high-quality, small-batch bath products than I think you will really enjoy the Crescent City Swoon experience. 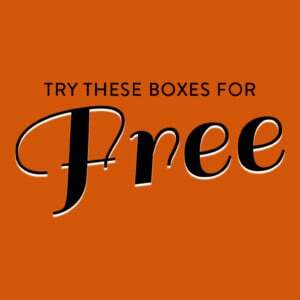 Can you get this box if you sign up today? No. If you sign up in March, you will get the April box. 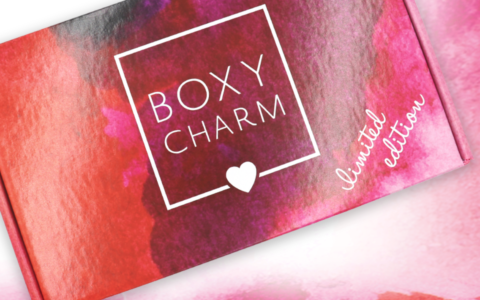 Check out more bath bomb subscription boxes in the Beauty Subscription Box List! What do you think of Crescent City Swoon? What is your favorite bath bomb scent? How do subscribers rate Crescent City Swoon? Do you subscribe to Crescent City Swoon? Add your rating now! Ughh! Wish shipping on this weren’t so expensive! I already sub to a bathbox but I’d love to check out another!